The tower is oblong on plan (Fig. 91), measuring 29 ft. 9 in. by 24 ft. 1 in. over walls 5 ft. 9 in. thick on three sides but 5 ft. only on the E., and stands 57 ft. high to the top of the parapet; it is built of rubble and contains four storeys, each of a single room. Originally built, to all appearance, in the early 16th century, it has undergone much alteration and patching, for the most part in the 19th century, though the triangular moulded pediment above the existing N. window of the second floor suggests that some alterations were made in the 17th century. Voids have been broken out and later filled in, some of the windows having evidently been altered twice or even three times; all the doors and windows now open are insertions except for one slit in the ground-floor room, and the corbelled parapets, the rounds, the projecting part of the turnpike, and the flat leaded roof are all of 19th-century construction. The outer face of the S. side shows a roof-raggle between the levels of the first and second floors, suggesting a two-storeyed extension of which no other trace survives; while another raggle, above second-floor level on the W. gable, points to the former existence of an extension here as well (infra). The ground-floor room, now the family burial-place of the Earls of Dunmore, is a high, barrel-vaulted chamber measuring 19 ft. on its N. and 15 ft. 6 in. on its S. side by 13 ft. 3 in. transversely; there are no corbels in its walls to suggest that it originally contained an entresol floor. There is a built-up slit just E. of the inserted S. entrance and another in the E. gable, just under the vault; the surviving open slit the upper part of which has itself been filled - is in the N. wall and may have been widened internally by the splays. The infilling contains a moulded stone incised with toothed ornament. On the outer face of the N. wall, W. of this slit, there is the built-up opening of a chute from a garderobe on the first floor. High up on the inner face of the W. wall, at its N. end, there appear two vertical race-bonds, probably representing a built-up doorway giving entrance from the bottom of a mural stair which is housed in the thickness of the W. gable; as the sill of this door would have been about half-way up the wall of the room, it must be supposed that it opened on to a wooden stair or ladder descending to the floor. The first-floor room is reached by a turnpike 7 ft. 4 in. 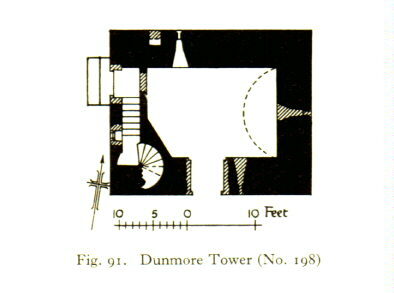 in diameter which rises, in the SW. corner of the tower, from the head of the mural stair in the W. gable; the doorway has been renewed and widened, and none of the internal features of the room calls for remark except two cupboards one occupying the garderobe in the N. wall and the other a doorway which was at some time broken through the W. gable to communicate with the W. extension. The second-floor room again shows no details earlier than the 19th century apart from a doorway broken through to the W. extension and subsequently filled up, and a cupboard with a segmental head at the N. end of the E. gable. In the third-floor room there is a cupboard at each end of the E. gable; both of these probably once possessed a small window, now closed up. This tower, at first known as Elphinstone Tower, was for more than two centuries the principal messuage of the barony of Elphinstone, which was erected in favour of Sir John Elphinstone in 1504 (cf. p.13). In 1754 it was acquired by John, 4th Earl of Dunmore, who gave his own name both to the tower and to the estate some four years later.2 In 1820-2 the 5th Earl of Dunmore erected the substantial mansion of Dunmore Park (No.301). It was presumably at about this time that the ground floor of the tower was first put to use as a family burial-vault,3 while some of the extensive alterations to the upper floors of the building (supra) may have been carried out during the same period. 1 Fraser, W, The Elphinstone Family Book, i, xxvxvi.